• Sherwan Haji - in this new video interview, actor Sherwan Haji explains how he was cast to play the character of Sherwan Haji in The Other Side of Hope and discusses his work with director Aki Kaurismaki and his real life journey from Syria to Finland. The interview was conducted exclusively for Criterion in 2017. In English, not subtitled. (15 min, 1080p). 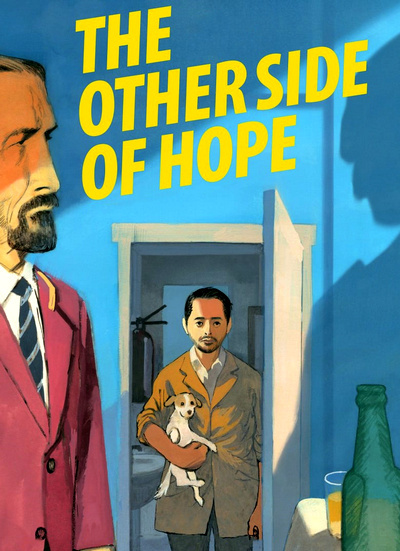 • Aki Kaurismaki at the Berlin Film Festival - presented here is footage from the press conference that was held after the premiere of The Other Side of Hope the Berlin Film Festival where the film won Silver Bear Award for Best Director. The panel is: Aki Kaurismaki and actors Sakari Kuosmanen and Sherwan Haji. In English. (29 min, 1080i). • Aki and Peter - The Other Side of Hope is dedicated to Aki Kaurismaki's longtime friend and collaborator, the film critic and festival programmer Peter von Bagh. In this new video essay, filmmaker Daniel Raim explores Aki Kaurismaki's oeuvre through the words of Peter von Bagh. In Finnish and English, with optional English subtitles where necessary. (12 min, 1080p). • Music Videos - four music videos with full versions of the songs that are heard in The other Side of Hope. • Trailer - In English, Arabic and Finnish, with imposed English subtitles where necessary. (2 min, 1080p).